For some thirty years, Dr. Charles F. Nesbitt was the teacher of preachers at Wofford College. A 1922 graduate of Wofford, Dr. Nesbitt took his seminary degree at Emory. He taught in the religion departments of several college – Lander, Millsaps, Blackburn College in Illinois, and Wesley College in North Dakota. He also taught in public schools in Kentucky. The academic life being his area of ministry, he pursued first an MA and then a PhD at the University of Chicago, completing his doctorate in 1939. He was also an ordained Methodist minister in the South Carolina Conference. It was in that year that he returned to South Carolina and to his alma mater, taking a position in the Wofford religion department that he would hold until 1966. As a practitioner of the academic study of religion, Dr. Nesbitt was a founding member of the southern section of the Society of Biblical Literature as well as a member of the American Academy of Religion. He was an active scholar, writing numerous articles during his time at Wofford. As a member of Wofford’s small but influential religion department, he taught Old and New Testament and other upper level religion courses to a generation of Wofford students who went on to seminary. He had the ability of identifying especially well qualified seminary students and sending them to Yale’s Divinity School or to his own Chicago. Those students found themselves well-prepared for the academic study of religion. Dr. Nesbitt, as religion professors sometimes do, ran into occasional critics of his writing and teaching. He once wrote a modern interpretation of the Apostle’s Creed for a lesson at Central Methodist Church, which found its way into print, and which caused a flurry of letters to the state’s Methodist newspaper about his having done such a scandalous thing. He had studied at the University of Chicago with scholars involved in the translation of the Revised Standard Version of the Bible, and encouraged the college to move to giving it at graduation. 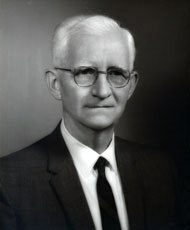 According to his former student and later colleague Dr. Charles Barrett ’55, Dr. Nesbitt had a strong hand in writing Wofford’s 1965 Statement of Purpose, which is still in effect, particularly the line “students and faculty alike will be challenged to a common search for truth and freedom, wherever that search may lead.” Dr. Barrett noted that not only had Dr. Nesbitt been a great teacher and scholar, he was a good and decent man as a faculty colleague. Dr. Nesbitt continued to live in Spartanburg until his death in December 1976, and his funeral service was held on Christmas Eve.